Providing guests unique and enchanting views from their rooms with its exceptional amenities, makes Maistrali one of bests in its kind. Cozy rooms next to the sea which calls you to deep inside nature and calmness by soothing sounds. All individually decorated rooms of Maistrali feature a flat-screen TV. Opening to a furnished balcony or terrace. 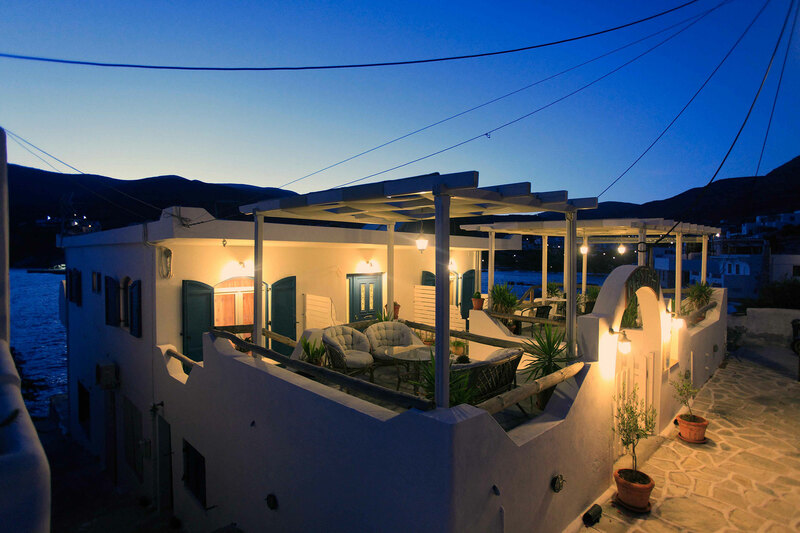 Maistrali Guesthouse is built in one of the most beautiful islands of Cyclades, Sikinos! Built in the embrace of rocks and in small distance from the beach of Alopronia, Maistrali, is certain that will charm you by it's beauty! At Maistrali you will find free shuttle service. Other facilities offered at the property include luggage storage. The property offers free public parking. 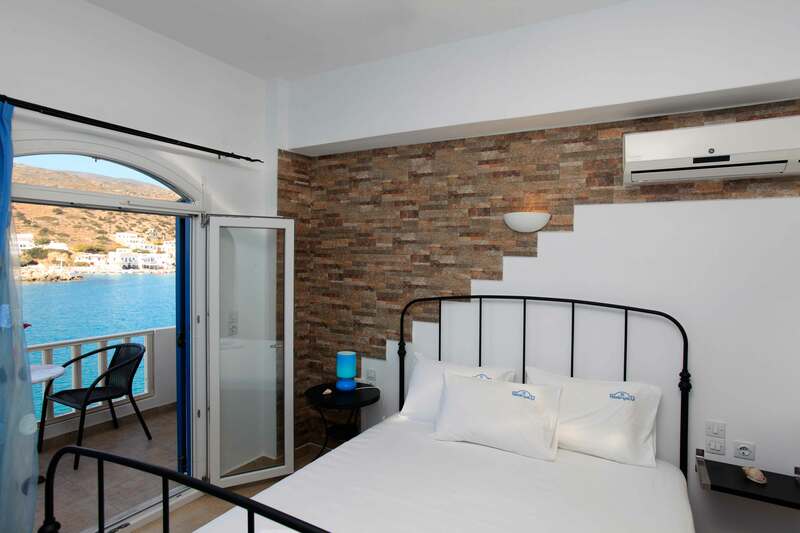 Half of our rooms have view to the splendid harbour of Alopronia and at extension, Aegean sea, while the rest have a wonderfull veranda with view to the Country of the island. All individually decorated rooms of Maistrali Guesthouse feature a flat-screen TV. Opening to a furnished balcony or terrace, each unit has a mini fridge and a private bathroom with a hairdryer and free toiletries. Maistrali Guesthouse constitutes an ideal destination for you that you wish your holidays to be calm and serene, in a place far away from the noises of city! We operate a 24 hour reception; therefore you are free to enter and leave the hotel 24 hours. Kapari restaurant is located in the town of Sikinos. We offer 10% discount to our customers that make their booking through our website. At any time if you call from your room for changing bed, cleaning the toilet & etc will be done. An extra service which is provided by the hotel, laundry costs are separate from room rates. We offer you free shuttle service from the port to the hotel and via versa. We can store your storage as you enjoy your day at the island or on the beach. Great location right on the water of the bay listening to the waves with good views. Comfortable bed, hosts very friendly with a basic but nice breakfast provided. Make the effort and visit their restaurant up in Kastro which had great quality food. Beautiful view, comfy rooms and really good value for the nice touches like lite breakfast, and room amenities. Peacefulness, outside sitting area, tastefully decorated, surprising breakfast, near to the port and a beach and taverns, friendliness of the people. Friendly owners, met us from the ferry; they also run a good taverna just at the entrance to the main village up on the hill. Great location right on the water, clean and comfortable room with its own balcony. The position: sleeping with the sound of the sea, staying in the terrace watching the moon and the lights of the town. Excellent hospitality, excellent view of the port and in a small walking distance from it! Breakfast was served in the room and included home made bread by the owner! The room was clean and spacious! Don't forget to eat at the owner's restaurant called "Kapari" in Chora! Delicious dishes and always served with a smile! Definitely recommended! Friendly atmosphere, super sea-view from our balcony, helpful owners. What more could you wish for? Our children had a seating area outside their room (Kastro) that was very convenient for all four of us.